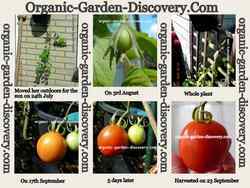 Upside down tomatoes plant can give you an easy and flexible frugal gardening experience. We had grown cabbage and cherry tomatoes with upside down gardening concept a few years ago. It was interesting! The most practical idea is to plant tomatoes with re-usable hanging baskets that, you can move your tomato plants any where you wish. Last year I had tried a hanging tomato plants project with the red egg-shaped tomatoes. Egg-shaped tomatoes really look like eggs. They have pointing bottoms. This red fruits are in clusters, about 1.5 inch in length, firm and juicy. They are crack free and rot resistant too and heavy cropping types of tomatoes. Set seeds 5 cm deep in the indoor growing bed. They will germinate in a week. Transplant the young tomato fruit plant when it is stable. Prepare a hanging basket with a half an inch (across) hole at center of the bottom or slightly further to the side. Set your plant in by carefully inserting the roots through the hole into the basket. Be sure not to damage the roots. Throw some rich potting soil around the roots; and sprinkle some rain water to position it. Add more soil to cover all the roots when you are satisfy with the plant position. Thereafter, sprinkle water on the top soil every morning and keep the ground always moist. Add more potting soil to the top once the roots shown upon the surface of the soil. When the tomato plant started to grow, it always grow upwards to the top of the basket. Afterwards it will be turning right down when the plant´s body is getting heavier. If the weather is extreme, the tomato plant would need more energy to fight against the strong wind storm or the heavy rain. So, the plant would slow down her growth and ended with little harvest. I remembered there were two weeks non-stop raining after I moved the tomato plant outdoor. So, I knew the harvest would be affected. Normally this egg tomato plants could be matured within 3 months from the seedling if you are growing them in the open ground raised bed garden. Most of the clusters are attached with six to seven fruits. Harvest from mid summer to early autumn. However, the end results will often be affected by the nature. You can eat this sweet tomato fruits fresh, cooked and making ketchup from it. 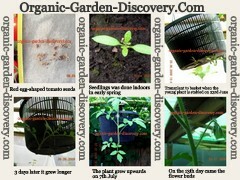 Try upside down gardening with different types of tomato seeds or grow them in different containers?